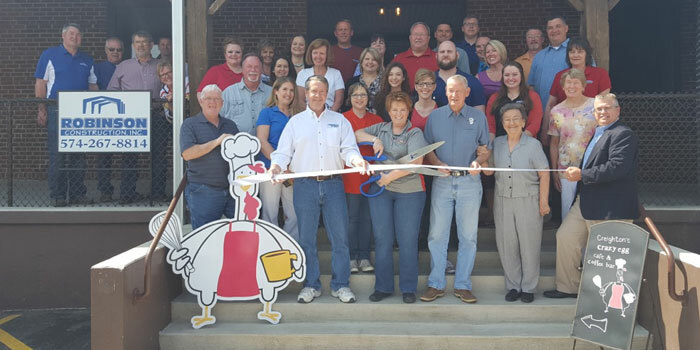 WARSAW — The Kosciusko Chamber of Commerce held a ribbon cutting for the Crazy Egg Café and Coffee Bar at its new location, 4217 W Old Road 30, Warsaw. The Crazy Egg Cafe is a full-service restaurant and coffee bar with rustic, farm-style, in-house-made coffee and food. They are also attached to The Roost, a 300-person venue available for events like banquets, weddings and, corporate gatherings. Renters are able to bring in their own catering or use Creighton’s chefs for their event. For more information visit their website at crazyegg.info. On Saturday, May 28, The celebration will continue with a balloon artist from Sweetcakes Entertainment from 9 a.m. to 1 p.m., corn hole out on the porch, new menu items and drinks from the coffee bar.